Ginger is a rhizome, or stem, of the plant Zingiber officinale. It has been used as a Cooking Spice, as well as for it Medical Properties. Ginger is available in Extracts, Tinctures, Capsules, Oils, Tea, and is also in Ginger Bread, Ginger Snaps, Ginger Sticks, and Ginger Ale. It can be used to Relieve Upset Stomach, as well as Nausea, Vomiting, Diarrhea, Motion Sickness, and Morning Sickness. New Studies have also shown it might have application in Treating Osteoarthritis and Rheumatoid Arthritis (UMMC). Ginger can relieve General Nausea and Vomiting, as well as Nausea and Vomiting associated with Pregnancy Morning Sickness, Surgery, and Chemotherapy. In a Study conducted, Pregnant Women who had 1 Gram/Day of Ginger over 4 Days, reported reduced Frequency and Severity of Nausea and Vomiting (Vutyavanich, Kraisarin, and Ruangsri 577-582). Also, WebMD indicates a lot of Clinical Research has shown 1 Gram of Ginger given 1 Hour Before Surgical Procedures result in a 38% reduction in Nausea and Vomiting during the 24 Hours Period Post-Surgery (WebMD). Another Study conducted on Cancer Patients receiving Chemotherapy discovered Ginger Supplements of 0.5-1 Gram/Day resulted in a 40% reduction in Nausea and Vomiting after Chemotherapy Treatments (Ryan , Heckler, Dakhil, and et al ). Ginger is known to reduce Inflammation, which might make it useful for individuals suffering Osteoarthritis and Rheumatoid Arthritis. In a Study conducted individuals with Osteoarthritis in their Knees who took Ginger Extra Two Times/Day, reported less pain, and required fewer Pain Killer (Altman, and Marcussen 2531-2538). Side Effects of Ginger include Heart Burn, Diarrhea, Stomach Discomfort, Menstrual Bleeding, Skin Swelling, Irritation and Redness, and Mouth Irritation. Individuals with Gallstones, Heart Conditions, or women who are Pregnant or Nursing should consult their doctor before taking Ginger. Ginger might interact with Anticoagulants, increasing the risk of bleeding. It may also interact with Diabetes Medications, which can cause Hypoglycemia. Lastly, it can interact with Hypertension Medications, causing Blood Pressures to drop too low. Vutyavanich, T, T Kraisarin, and R Ruangsri. “Ginger for nausea and vomiting in pregnancy: randomized, double-masked, placebo-controlled trial..” Obstetrics and Gynecology. 97.4 (2001): 577-582. Web. 28 Jun. 2012. Ryan , JL, C Heckler, SR Dakhil, et al. “Ginger for chemotherapy-related nausea in cancer patients: A URCC CCOP randomized, double-blind, placebo-controlled clinical trial of 644 cancer patients..” Journal of Clinical Oncology. 27.15 (2009): n. page. Web. 28 Jun. 2012. Altman, RD, and KC Marcussen. “Effects of a ginger extract on knee pain in patients with osteoarthritis..” Arthritis and Rheumatism. 44.11 (2001): 2531-2538. Web. 28 Jun. 2012. Ehrlich, Steven. “Ginger.” University of Maryland Medical Center . N.p., 13 Dec 2010. Web. 28 Jun 2012. “Ginger.” WedMD. N.p., n.d. Web. 28 Jun 2012. Wong, Cathy. 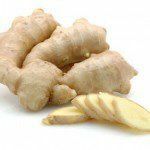 “The Health Benefits of Ginger.” About.com Alternative Medicine. N.p., 15 Jun 2009. Web. 28 Jun 2012.